Humanity's myths are dreams of dragons. No other creature is quite so present, so dominant, in our stories. Almost every culture has its own tales of the serpents. Our fantasy reflects this, and dragons have been one of the defining elements of the fantasy genre for decades, and their pedigree in adventure gaming is obvious. There is good reason for this pre-eminence - no other creature has the power or the terrifying majesty of the dragons, no other creature has the curious alchemy of horror and glory that makes dragons so wonderful. On leathern wings, they soar across the skies of our imagined worlds. Their fire threatens the world, but also illuminates it. Dragon Lairs has all the detail needed to design a dragon's lair, from a dank cave filled with rotting remains of previous adventurers to an ancient ruined city despoiled by the beast. When a party finally encountes the dragon, Flattery and Riddles lets them have a few last moments before the dragon employs its Tactics and Warfare to wipe them out. Age Advancement presents a variant method for creating dragons especially skilled in warfare, or magic, or some other field of expertise. A selection of new Feats (with especial emphasis on the feared breath weapon) follows. The rules in those two chapter are then used as the basis of a system of Dragon Design. The nightmarish fruits of that system are repesented in New Dragons, ranging from the parasitical Sin Dragons to the noble Heraldic Dragon and chaotic Planar Dragons. Dragon Magic has new spells and items for dragons (and their enemies). Lifecycle and the Heritage of Dragons examines the egg. 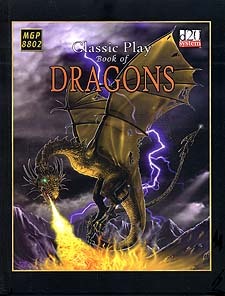 Campaigning contains advice on using dragons in a game, as sysmbols, enemies, allies, mounts or even characters. Finally, a mortal Miscellany deals with the response of the lesser races to the dragons. Requires the use of the Dungeons & dragons Player's Handbook, v.3.5.